HandKrafted by Stephanie: MTME Fancy a Cuppa? and To Go! MTME Fancy a Cuppa? and To Go! Hello! Today, Lauren, Catherine, Tracey, Debbie and I have more My Time Made Easy projects to show you from the October release. Debbie has been our October Guest Designer, but Lauren recently announced that she is now a permanent designer on the MTME team.. Welcome, Debbie!). Today I have a gift set using two new templates, Fancy a Cuppa? © and To Go! ©. 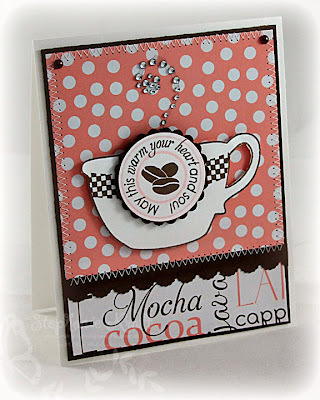 When I first saw the templates, I knew that I would be making this for a coffee loving friend! I went looking for some goodies to fill it with and first found some Starbuck's caramel coffee, so I decided to go with the caramel theme -- Werther's chewy caramels and caramel chocolates plus some Ghiradelli dark chocolate and caramel squares.. yum-O! Fancy a Cuppa? © is the carrier.. The base is Dark Chocolate cardstock. The front and inside back is decorated with Kristin's Cafe Text digi paper (from the All Steamed Up © paper collection). 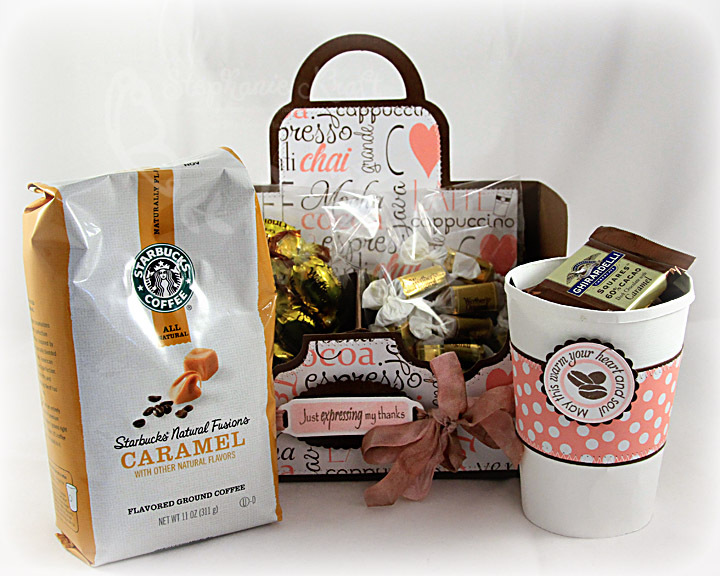 Below I removed the bag of coffee and the cup of chocolates -- you can see more candy in the back.. this little carrier holds A LOT! Below is a look at the carrier empty. Inside I added the optional divider. And here's a closer look at the details. I added stitching around my decorative layers and added a label in the front. 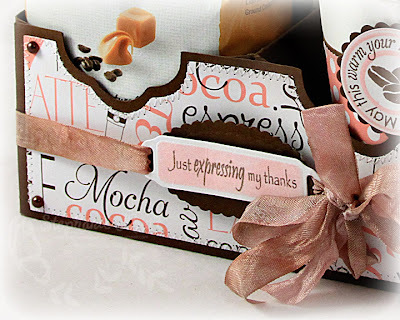 "Just expressing my thanks" is from Grab a Cup Sentiments ©. 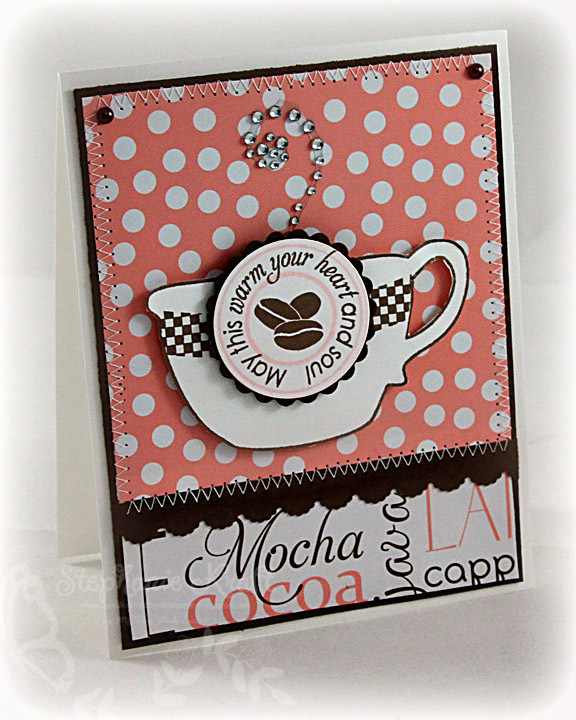 I stamped onto white cardstock and cut out with a Spellbinder's ribbon tag. I sponged some pink ink while it was still in the die. I popped that onto a Dark Chocolate scalloped oval. The labels are tied around the carrier with some dyed seam binding ribbon. And now for a closer look at To Go! ©. Your eyes do not deceive you.. To Go! © is the cup, entirely made from cardstock (and even made to fit those to-go coffee lids). The template even comes with the warmer band. 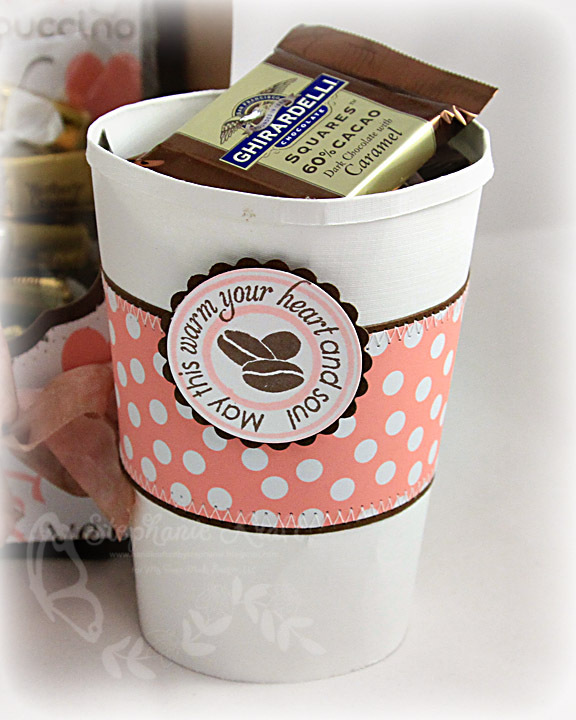 I put a layer of Cafe Dots (also from All Steamed Up ©) over my Dark Chocolate cardstock and stitched both layers directly onto the cup so I don't have to worry about it coming off. The round label and sentiment (reads "May this warm your heart and soul") are from Catherine's set, Fancy a Cuppa? Add On © and the coffee beans are from Fancy a Cuppa? ©. Finally, here's a closer look at the accompanying card. I used scraps from my project, made a duplicate of the round tag and popped it onto the big coffee cup (from Fancy a Cuppa? ©). A little stitching, pearls and a rhinestone flourish (for steam) finish it off. Thanks so much for stopping by! I will be back tomorrow for MTME final group post day! 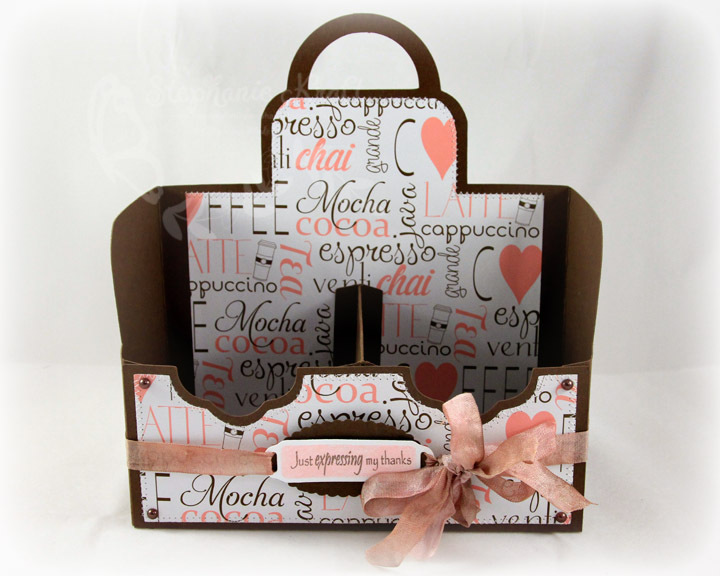 Accessories: Fancy a Cuppa? and To Go! templates (MTME), Scalloped Petite Oval and Scalloped Standard Circle Nestabilities, Ribbon Tags Shapeabilities (Spellbinders); Circle punch, Scalloped Scallop border punch (EK Success), Chocolate pearls (Kaisercraft), Rhinestone flourish, Glimmer Mist (Tattered Angels), Seam binding ribbon, Foam tape, Thread, Sewing machine. Wow. Love this, Stephanie!! I love the color combo and the stitching. Great project and I'm sure you are going to have a happy friend! Wow Wow WOw... Fabulous set. Love the colors/papers you selected and all the details are just gorgeous! OMG! This is just amazing, love it all and all the little details you have added! 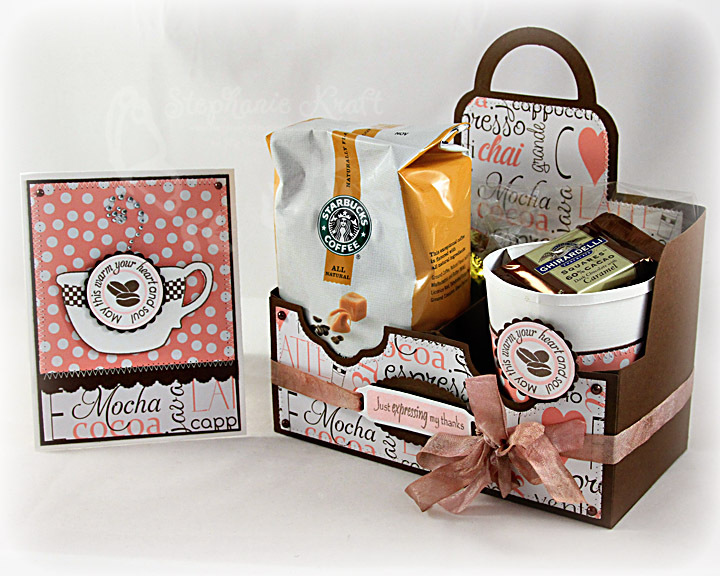 What a perfect gift for a coffee lover! FABulous gift set, Stephanie! 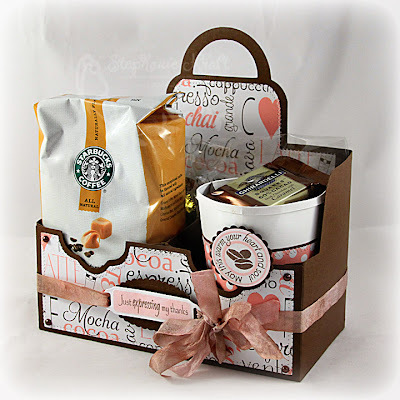 Yummy inside and out, and I LOVE how you used the rhinestones for steam from the coffee!